When it comes to packaging, color is the most efficient way to communicate with costumers and to give them a sort of preview of the product. It is said that people perceive colors much faster than text or shapes, so they find and choose products primarily by colors. It’s not surprising then, that printing plays an important role in the packaging industry. Special inks based on special color systems enter the market all the time, helping brands in creating packages that stands out. The CMYK color model is used in color printing, and refers to the four primary inks used in color printing: Cyan, Magenta, Yellow, and Key (black). 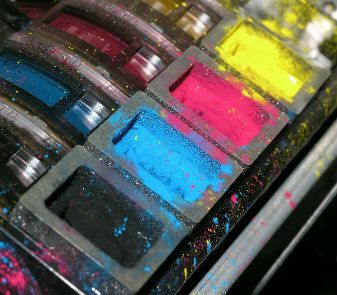 In the printing and graphics industry varying cyan, magenta, yellow and black creates an endless array of colors. The Pantone Matching System (PMS) uses standardized colors. It is a proprietary color space, used in a variety of industries. The main advantage of this system is that each color is always depicted the same, for every manufacturer, everywhere in the world. It is quite difficult to get bright and sharp colors with CMYK, and in comparison to PMS colors, they sometimes seem a little bit dull. This could be problematic, because the brightness of colors is important for packaging design to communicate attributes like energy, vitality, freshness or strength. Another issue with CMYK-based inks is that the colors could change from one print run to another. These inconsistencies are usually barely noticeable for untrained eyes, but can affect the perception of the brand. For example, consumers might interpret a small color difference as a sign that the product has been on the shelf for a long time. The PMS color system only needs one printing plate, while the CMYK needs four plates. Running on one plate means it is more controllable. The downside of PMS is that it’s more expensive than using CMYK. Also, there are still some areas where you have to use CMYK, like photography, where you always need four colors. Deciding which color system is better for you depends on the specific resources and requirements of both your print store, and your customers.